After Hurricane Irma passed through Bonita Springs in September of 2017, I promised myself that I would write a manifest on storm protection for you, the Bonita Springs home owners and future real estate buyers doing research. I stayed through Irma and learned a lot before, during and after. I'm certain that I earned a doctorate in Hurricanes from Irma. It was a monster storm and the Bonita Springs, Estero, Fort Myers area had basically been untouched by storms for over a decade so some people were a caught a little off of the game. Most heeded the early warning to prepare for the storm but there were still unforeseen complications that home owners and even condo owners ran into during the process of storm prep. This is a great opportunity to learn from the mistakes of others so that you or your family can avoid being taken out by something as small as a wing nut. 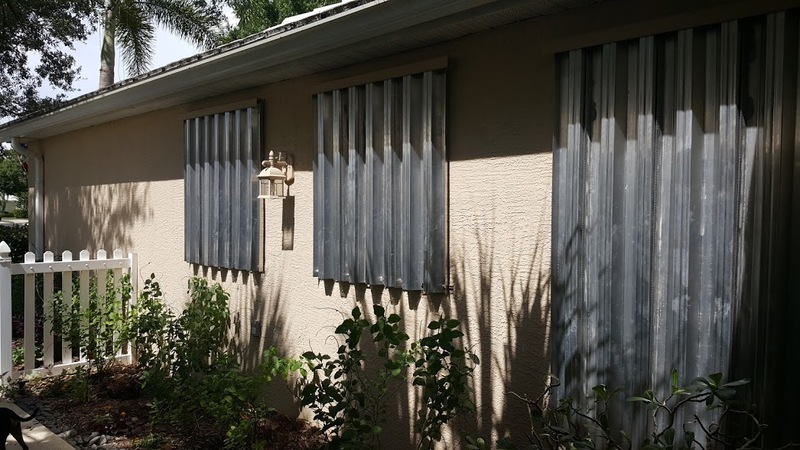 Here are a few hurricane shutter pitfalls that you, as a Bonita Springs home owner, may have never thought about or would think about until you’re in the thick of it. Why would you need tips for impact windows? Aren’t they the best protection? Well, many homes and condos in the Bonita Springs area have them simply for the ease of dealing with storms and the insurance benefits but there are a few things you may have not considered. First, if you lock yourself out of your home you will need a locksmith to get in because you can’t jimmy a window or even break a window to get in. Remember, if your power goes out and you left via your overhead garage door … you won’t be getting in. I know locksmiths made a fortune picking front door locks for home owners who left through the garage and didn’t have a house or condo key to get in because their garage door opener is electric and power was out for weeks in some areas. Second, consider leaving a note taped inside the window that reads that it is impact glass and your cell number. The authorities will have a way to contact you to verify your safety and looters won’t even start banging on your windows trying to break in. They could potentially crack or scratch them and it would be expensive to fix. This style of home shutter has a lot of challenges. Make sure you set a calendar alert either on your real “paper” calendar or your Google calendar to check your shutters in May. Checking your shutters should include counting the panels and finding the bag or box with your “wing nuts” and bolts. You can’t put the shutters on the house without bolts and wing nuts or sometimes it’s a wing nut/washer combination on a bolt. Simply put, it is impossible to purchase bolts and wing nuts in the middle of a storm crisis. Do yourself a favor and purchase a small fishing tackle box and clearly label it “wing nuts and bolds for storm shutters”. Consider tying it or chaining it to something stationary. If you store it in a bag they will be thrown away or misplaced because they look like a bag of old hardware. Consider trading up one or two of your metal panels for clear panels because you are going to want to look outside and your home will be dark as a cave. 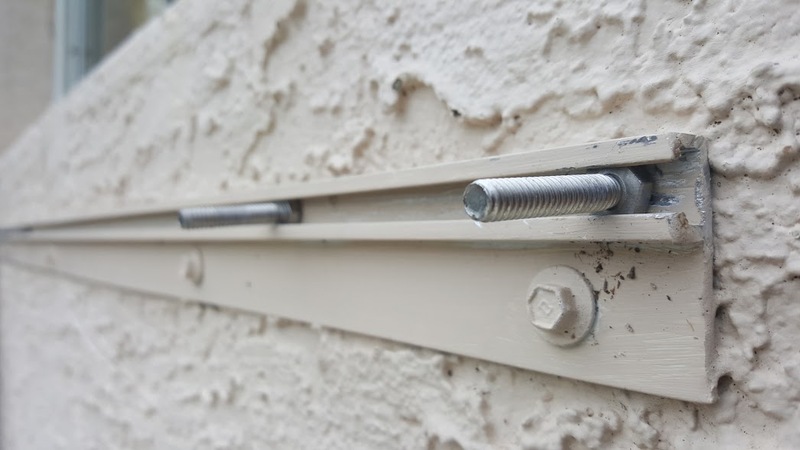 If the exterior your home has been repainted anytime between the last storm and the next storm it will be incredibly hard to get your storm panel bolt heads into the slot. They are engineered to not have a lot of wiggle room and one coat of paint is going to make your life tough, two coats require WD40 and a hammer and swear words. Ask me how I know. Buy a couple sets of fabric gloves with the fingers dipped in latex or neoprene so you can grip the small parts and to protect your fingers. You’re going to be scraped and cut to ribbons. Put the gloves in the tackle box with the storm panel wing nuts and bolts. Tape it shut with blue painters take to keep the curious out of your gear. If your home is two story and you have manual shutters consider putting on a safer, user-friendly shutter system, at least on the second floor. Finding someone to put them up or take them down for you is a challenge under the gun. Find someone in May or June and don’t be afraid to put them up days before a storm. September is usually our dicey month so just know you need the details ironed out before season and you need to double check your resources just before September. If you've never put the shutters up on your home you might want to try without the threat of a storm to make sure they are all there and some of the panels didn't "walk off". When you take them down number and label them and create a paper directory to go in your hardware box. Sadly I did hear tales of people who couldn't find their panels or there were panels missing or the home was a foreclosure that didn't come with shutters and they forgot to replace the panels and wing nuts. Many condos and multi-story homes have accordion shutters to reduce the risk of falls from a ladder because they can be closed from inside the home. Periodically open and close your accordion shutters but beware of wasps. They like to build nests in them. Most accordion shutters come with a lock. Those on the second floor of a home or condo will have he lock on the inside for ease of use. Those on the ground may have a lock on the outside. Find a way to not lose the keys for the shutters. I don’t know what the solution is for that but you need to have dozens of keys and keep a few in a safe or jewelry box so they do not get lost. Many home owners “set it and forget it” with roll down shutters. They need to be periodically opened and closed to make sure they work. Finding service when a storm is barreling toward you is nearly impossible. Locate your manual hand crank. Even electric shutters have a manual hand crank because … well, the power will likely go out during a storm so the only way to open your windows will be with a hand crank. You may be able to get an attachment for a battery operated drill that would also wind up the shutter. You won’t have A/C so you will need the shutters up to be able to ventilate the residence during the recovery process. Take a piece of paper and label your hand crank “this is a hand crank for the storm shutters, do not throw away”. Yes, people lose them all the time. Remember, if you roll down your electric shutter to your front door and you leave through your garage you won't have a way to get in if the power is out for weeks. You may want to reconfigure ingress and egress strategies to your home. There are many homes in Bonita Springs with standard, builder grade windows and no storm protection whatsoever. Some folks just never put shutters on and they’re just rolling the dice with Mother Nature. These are the home owners who, by default, opt for plywood panels on the windows in the event of an eminent threat. Trust me when I tell you that it doesn’t take long for plywood and other plywood-shaped resources to run dry even a few weeks before a storm hits. Not only does plywood become scarce but so does any other type of lumber, paneling, boards, or even fencing. The tools and hardware quickly disappears, too. Saws, drills, drill bits, screw drivers and most importantly Tapcon screws. If you don’t know what those are, well, you’re going to need them to screw plywood to your home or condo and I can tell you that they probably had a street value higher than some of the most illicit drugs, during Hurricane Irma. The Home Depot on Bonita Beach Road looked like it was turned inside out. The shelves were bare and merchandise was just offloaded into carts, never hitting the shelf, for weeks. Along with planning by collecting supplies and tools you’re going to want to resource actual humans who can put the panels up if you aren’t resourceful or strong enough to do it and to also take them down (and label them) so they can be stored for the next storm. Do not pay in advance for take-down as a lot of people have hardship or too much work to do after the storm and may not be able to return to finish the job. Above all things remember that covering windows isn’t going to make you 100% safe. There can be floods and storm surge. Always remember this: Hide from the wind but run from the water. You can download an elevation app for your phone if you don’t know how high you are above sea level. You never know when you’ll have to head to higher ground so you should probably know your elevation. Spot on as usual, Chris. The experience is stressful enough without chasing rumors of plywood all over town. I was at a Lowes at 5:30am after being promised plywood would be delivered overnight. It wasn't. Over $600 later on wood planks I was lucky to find, I never want to be caught like this again. And still had no way to fasten them! Be ready to repair your stucco after yanking out the nails from a nail gun. Spot on great advice on window protection! No need to nail plywood into one's stucco, then yank them out again. There are permanent bolts that one can place in the exterior walls, that can be used to secure plywood. So each time shutters go up and down, just screw the plywood (already cut to size, of course) to these permanent bolts, and remove it afterwards. Yes, not everyone can afford metal shutters. I like that you provided some accordion shutter tips for your home such as making sure to open and close them every now and then. This way, you would be able to prevent wasps from building nests in them. Also, it's recommended that you put a lock on your accordion shutters just in case you will not be using them for some time. This would also help prevent accidents from occurring due to the shutter suddenly falling down. If I were to purchase accordion shutters, I would make sure to keep this in mind. Thanks.